Winters can be hard on us all, landscaping included. As buds begin to appear throughout your property you may notice, with a sinking heart, that some of your plants and designs aren’t looking quite the way they did last year. Winters can be hard on us all, landscaping included. We’ll take a look at the three most common causes of winter landscape damage and help you learn how to repair them. Regardless of winter damage Atlantic Maintenance Group can have your spring landscape looking good as new in no time. When winter leaves small animals such as rabbits, rodents, and deer with few food choices trees and shrubs can begin to look like a five-star meal. The hungry animals will feed on any exposed plant parts they can. If this damage is minimal the plant should spring back, in fact, some require such trimming. If the damage is excessive you may need to replace the affected plants and consider preventive measures for next year’s winter maintenance. If, as the ground starts to thaw, you notice your plants wither and die rather than springing back to life, you may have experienced root injury. When temperatures drop below 15˚F the roots of less cold-tolerant plants can be put at risk. To prevent this, work with your landscape professional to find more cold-tolerant plants or to develop a cold temperature action plan. If you’ve noticed browning, rusty foliage you landscape might be the victim of two of winter’s most common culprits, Winter Burn and Salt Damage. Winter Burn or Sunscald is not always visible on leafless trees, but you can often see it on evergreens, whose needles will change color to a golden brown. Likewise, salt damaged plants will appear burnt and brown. The easiest way to distinguish the two is by proximity to road salt exposure. While winter burn is more difficult to repair, to prevent salt damage consider switching to Brine based deicing next winter. 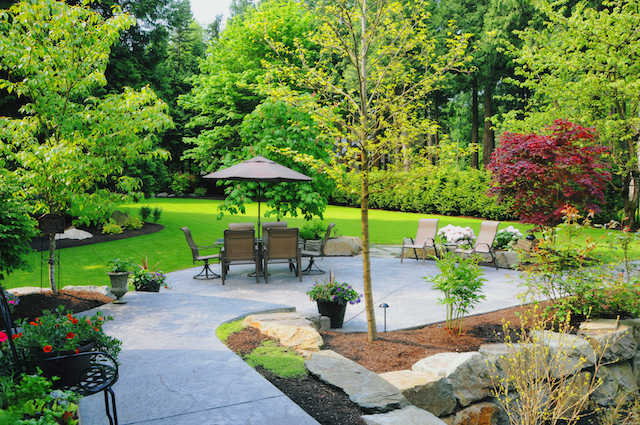 Whether you need your landscape updated, a new winter plan, or simple maintenance, Atlantic Maintenance Group has you covered. If you are looking for help keeping your residential or commercial property free from soil erosion or other lawn diseases, Atlantic Maintenance Group is ready to help you with our variety of landscaping, asphalt, snow removal, and concrete maintenance services. We are experts in our field, and we are prepared to meet your needs with a price and product that will leave you grinning. If you’re interested in getting a free quote or more information, visit us online or give us a call at (410) 768-4720. To see examples of our work and stay up to date on our specials, follow us on Facebook, Twitter, Pinterest, and Google+. This entry was posted on Friday, April 6th, 2018	at 9:28 pm	and is filed under Landscaping Maintenance	. You can follow any responses to this entry through the RSS 2.0	feed. Both comments and pings are currently closed.